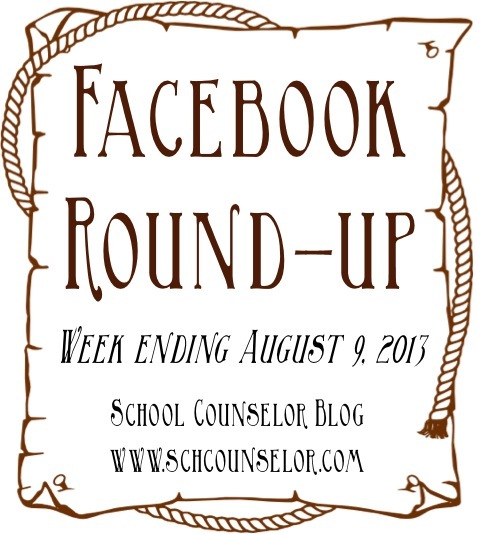 There is a lot of great discussion happening on the School Counselor Blog Facebook Page Each Friday I share some of the week's most popular posts and fan questions from the School Counselor Blog Facebook Page. Jacyln is looking for posters and decorations for her new office. What stores and online retailers do you recommend she check out? Click here to read the comments. Do you give out anything (trinkets, candy, brochures, etc.) to introduce yourself to school staff? Share your creativity below! Click here to read the comments. Brandy is looking to connect with other school counselors who have a spouse in the military. She wants to know how others deal with moving around and transfer their license from state to state! Share your resources and suggestions below! Click here to read the comments. Jessica is looking for bulletin board ideas to advertise her school counseling program. Share your ideas or where you find bulletin board ideas! Or feel free to upload pictures too! Click here to read the comments. Jennifer just got a job as a 60% counselor in an elementary school. The staff in her building are uncertain about her position as a counselor. How can she prove to the staff and administration of the district that her position as a school counselor is of utmost importance and needs to be full time? Click here to read the comments. Amy is fresh out of grad school and just got a job as k-5 counselor! She is feeling overwhelmed and wondering what her first steps should be. Any suggestions? Click here to read the comments. Do you run book groups or book clubs at your school? If so, what book(s) do you use? Please share your level, book(s) you use, and any activity ideas! Click here to read the comments. What do you eat for breakfast before school? I am always looking for quick and healthy breakfast ideas! Yesterday I asked about lunches and I can't wait for your breakfast ideas! Click here to read the comments. How do you decorate your school counseling office walls without destroying them? I would love to know what other hanging products people use! Click here to read the comments. Beata, a first year as a high school counselor, is looking for some ideas on how to run new student orientation groups for students that register after the school year begins. Share your ideas and suggestions below! Click here to read comments. Share Your School Counseling Office Pictures! Share your school counseling office pictures here! Facebook now allows you to add photos in the comment section! I thought this would be a fun way to share pictures of your office with other school counselors! Share your pictures below in the comment section! Tag your picture ‪#‎scoffice‬ so it is searchable! Also, feel free to post unfinished pictures and ask other school counselors for advice and decorating tips! Click here to read the comments. What do you take to school for lunch? I am always looking for new ideas of what to pack! Share your ideas below! Click here to read the comments. Nichole is starting a new position this year as a Middle School Counselor working with 7th graders. She is starting from scratch in a new state and new school! Please share any middle school ideas and resource you have for Nichole below! Click here to read the comments. Jennifer is looking for ideas of how to use Google docs in her work as a school counselor! How do you use google docs? Click here to read the comments. April is looking to connect with other high school counselors! Like or comment if you are a high school counselor! Feel free to share ideas or ask questions! Click here to read the comments.